Have you ever wondered what Vietnamese cuisine is like outside of� Vietnam? There have been numerous articles about Vietnamese food in faraway lands, such as Australia and the United States, thanks to the large Vietnamese diaspora in these places. However, not much is known about Vietnamese cuisine in neighboring countries, especially in my homeland: a little sunny island about a 2 hour flight away from� Saigon called Singapore. 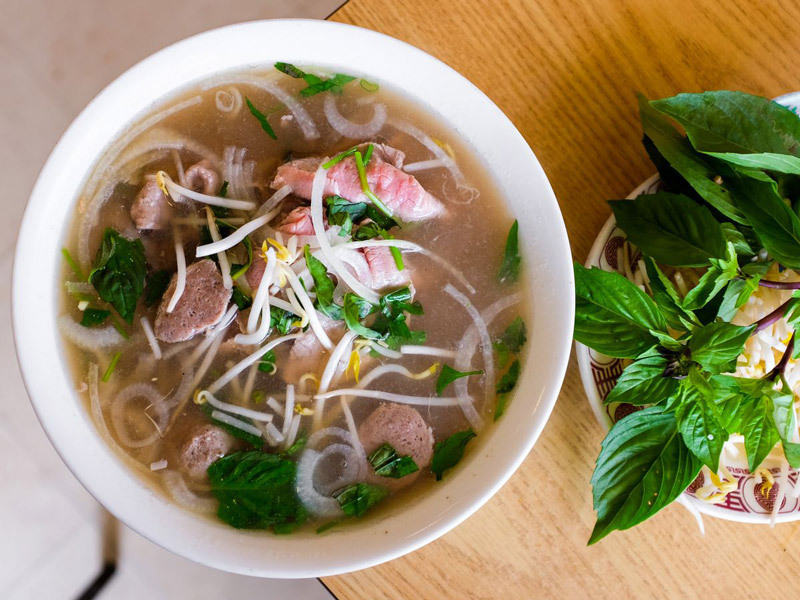 If you happen to be there and have a sudden craving for authentic� phở,� Hủ tiếu Nam Vang and� bánh xèo, would be able to find them? Well the good news is, yes, you can. Now, you might be thinking, “no, wait. It’s going to be super expensive”! Well, you’re both right and wrong. 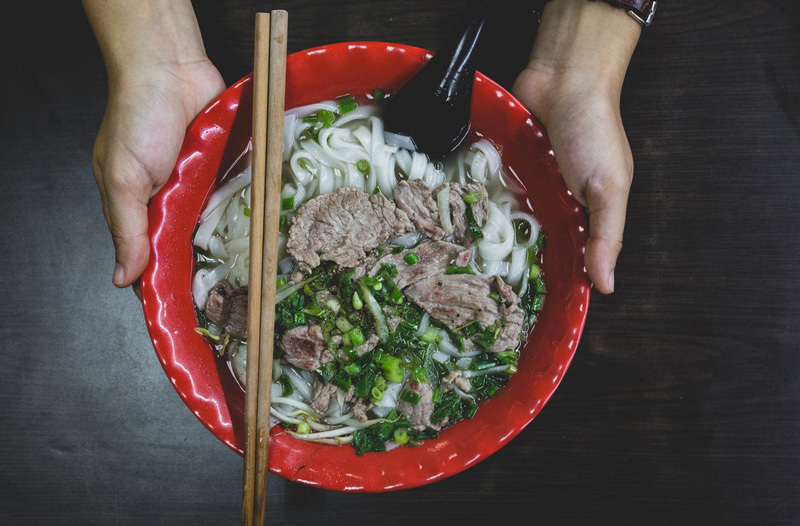 You’re right that Vietnamese food in Singapore can be overwhelmingly pricey, however, if you know where to look, and don’t mind a little bit of adventure while searching, you can actually find a decent bowl of� phở� for almost the same price as in Saigon. Curious? Read on. First of all, a little background information. Due to Singapore’s proximity to Vietnam, and the large number of Vietnamese students and professionals who’ve moved to Singapore to study and work, there has been an explosion of eateries catering to this demographic over the last decade. Most of these eateries were opened either by Vietnamese migrants, or enterprising Singaporeans with a love for Vietnamese cuisine. So here comes the disclaimer: the dishes here may be authentic, but they aren’t region-specific. To a Singaporean, a� phở� is a� phở, regardless of whether it’s prepared in the style typical of Saigon or Hanoi. 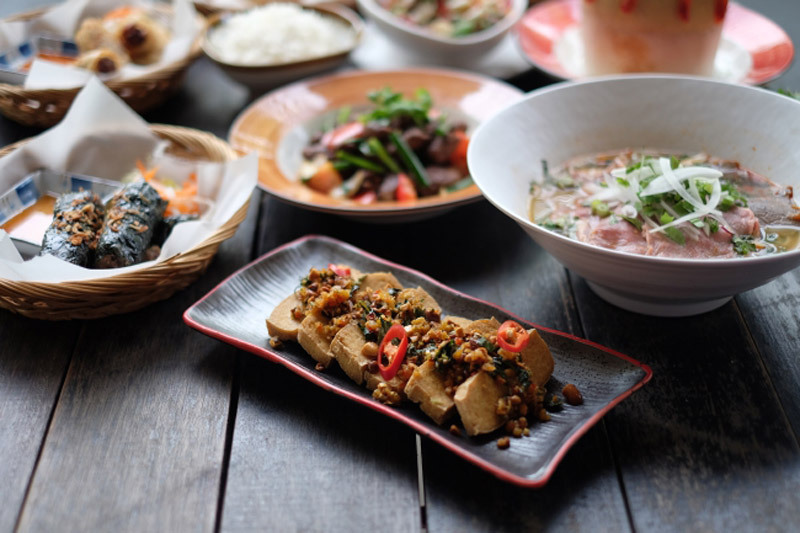 The eateries featured here have some of the best� Vietnamese food you can find in Singapore, and some of them are also highly recommended by Vietnamese people who have visited the country or live there. They are listed from “as pricey as you’d expect” to “for real”? 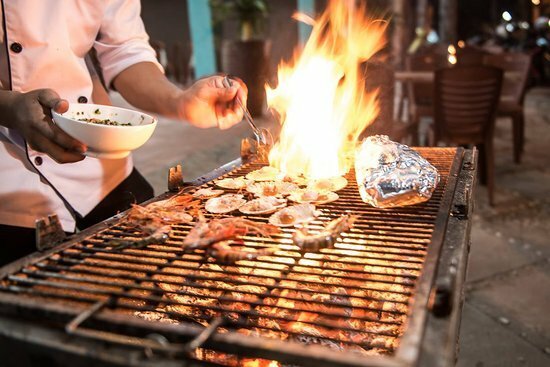 Located in Novena Gardens along Thomson Road,� Saigon Alley is the closest you can get to an authentic upper-class dining experience in Saigon, save two details: the impressive English proficiency of the mainly Vietnamese staff and the prices. One of their most popular dishes, spicy Australian beef noodles, costs about SGD14 (VND240,000). For that price you’ll get something that looks like bun bo hue, but with a slightly spicier broth, and with a very generous serving of sliced Australian beef and brisket, as well as herbs like mint and basil. They are also quite well known for their fresh spring rolls, which are actually new interpretations because you won’t find these versions in Vietnam. The fresh Vietnamese tiger prawn rolls are huge, simply because of the size of the prawn, which is tightly packed into and yet, still clearly visible through the rice paper. The crab spring rolls are another great variation, containing a generous amount of real crab meat. Each roll costs SGD8 (VND137,000). 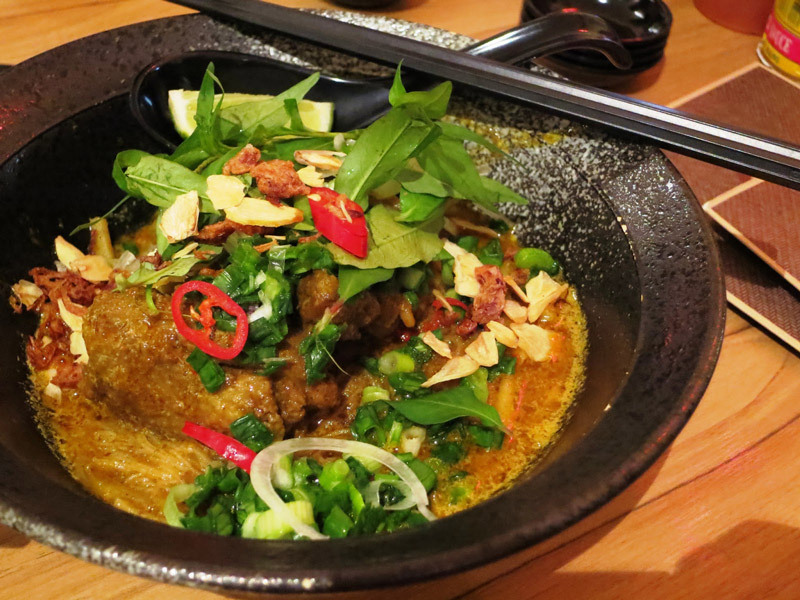 Although the dishes are pricey, it’s probably one of the best places in Singapore to get delicious Vietnamese food, including a few imaginative variants of popular Vietnamese dishes in a clean restaurant with great ambience. Perfect if you’re missing Vietnam, and have money to spend. I experienced Vietnamese food for the first time in my life on a rainy day in Singapore in 2013. I walked past this restaurant in Raffles City, and my friend remarked that she had “heard some good things about this place”, so we decided to check it out. It didn’t change my life, but it definitely opened my eyes because it’s where I had my first� phở. What I found interesting about� Nam Nam is that there is a huge diagram on the wall that teaches you how to eat phở. The restaurant specialises in Hanoi phở, and the toppings range from chicken (SGD9.90/VND170,000), to beef steak slices (SGD10.90/VND187,000), and medium rare wagyu beef (SGD19.90/VND341,000). 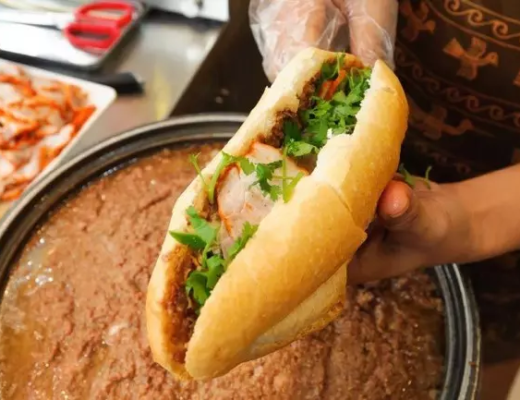 You can also find� bánh mì with toppings such as smoked salmon, cold-cut meats, and caramelised pork belly for not-so-authentic prices, like VND130,000. Just by its name, you know this entry is going to be all about� bánh mì.� Sandwich Saigon Cafe has some of the best� bánh mì you will find outside Vietnam with just one drawback: it costs about SGD7 (VND120,000), which is about 10 times the price of what you’ll get in Saigon. However, if you look beyond the price, the authenticity of the taste, texture and ingredients will remind you of Vietnam. This is the place Singaporeans go after returning from a trip to Vietnam to recapture their favourite food moments. 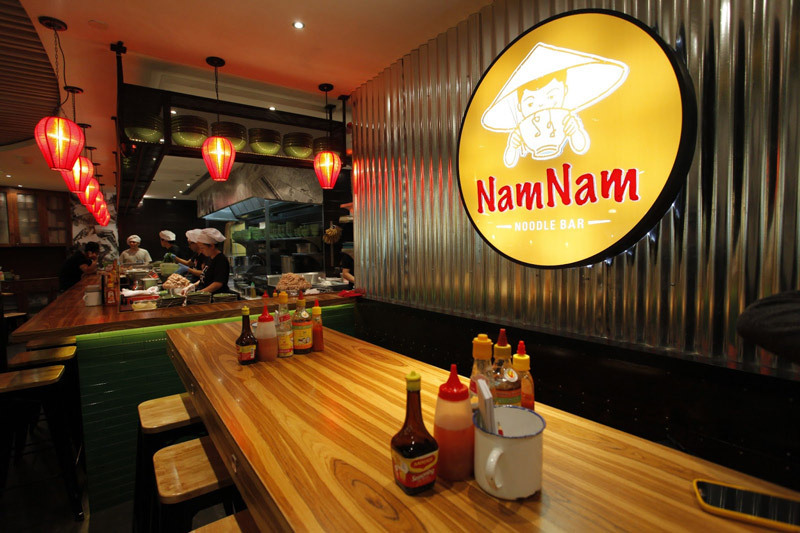 Vietnamese expats also head to this place when they start missing the tastes of home. The� bánh mì xíu mại is to die for, with its giant pork meatballs and vegetables. One additional condiment used here is mayonnaise, which is not commonly used in Vietnam. But it works like a charm. The baguette is crusty, yet airy, a perfect contrast of crunchiness and softness in one bite. There are also a wide range of fillings available, such as pork-chops, garlic chicken, roast beef and more. 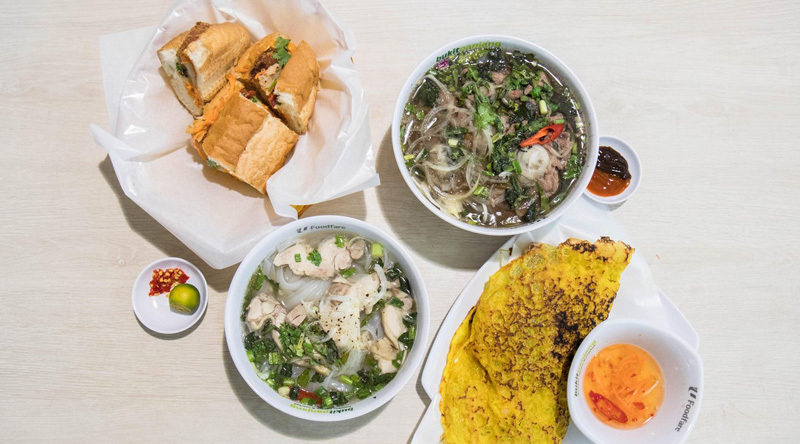 Located at Grandlink Square in Singapore’s Geylang district,� Little Vietnam is a charming little eatery serving decently-priced Vietnamese fare in a comfortable setting. They are known for their fried spring rolls, which are served in sets of 5, for SGD5 (VND86,000). Filled with chicken, vegetables and glass noodles, the rolls are slightly larger than what you’d find in Vietnam and are deep-fried to perfection. They have a pretty huge menu with offerings such as� chạo tôm going for SGD5 (VND86,000),� gỏi ngó sen for SGD6 (VND103,000) and phở, starting from SGD6, depending on what toppings you choose. The� bún thịt nướng served here costs about SGD6 (VND103,000) but looks and tastes exactly like what you find in Vietnam. It’s a very popular dish in this restaurant. Take note that if you’re planning to have a beer here you will need to reserve a table inside the restaurant due to alcohol restriction laws in Singapore. You can’t drink outside the establishment. The place is very popular and often filled to capacity so making a reservation is highly recommended. Earlier in the article, I mentioned that if you know where to look, you can find some excellent Vietnamese food at almost authentic prices. Here are two places you might want to consider. One of them will be a bit of an adventure. For fans of� bánh xèo, this is probably one of the best places in Singapore to get authentic versions of the famous Vietnamese crepe. Located in Bukit Panjang Hawker Center,� Saigon Food Street is actually a stall in a residential neighbourhood accompanied by other street food stalls. This means that you can choose your seat, and buy a variety of dishes from different stalls at the same time. The hawker center is a Singaporean concept, in which a bunch of� street food vendors are centralised in one complex. 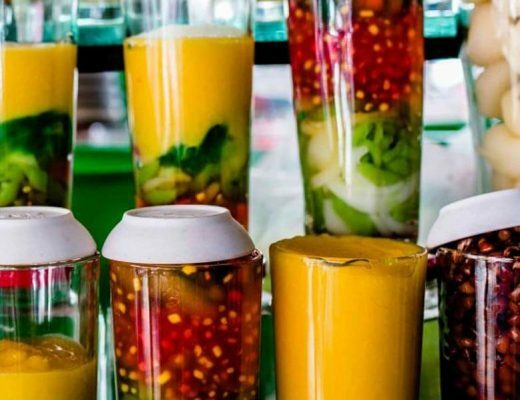 It is the model behind� Ben Thanh Street Food Marketin Saigon’s District 1. The� bánh xèo in this stall is priced at SGD5 (VND86,000) and is made to order. With fresh and succulent shrimp and slices of delicious pork wrapped up in a razor-thin pancake, it’s as good as some of the best� bánh xèo I’ve tried in Saigon. You can also find other dishes at authentic Saigon prices, like� phở for SGD2.50 (VND43,000) and spring rolls for SGD5 (VND86,000). If you take Bui Vien and compress the entire street into one building, you will get� Orchard Towers, one of the seediest parts of Singapore and also colloquially known as the “four floors of whores”. 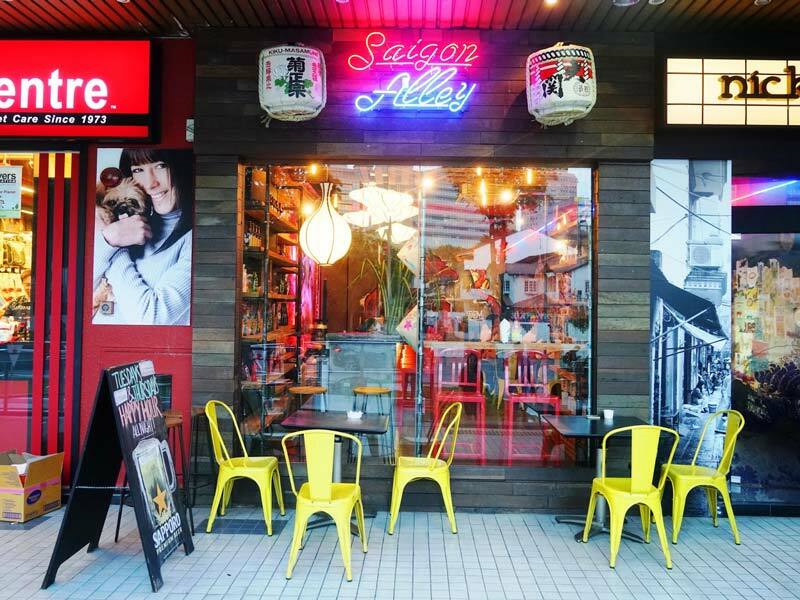 Made up of establishments where you can find some of the cheapest booze in the country, massage parlours and gogo bars, it’s also home to one of the best and most affordable Vietnamese eateries you will ever find in Singapore. Located on the 4th level,� Thien Long is one of only two eateries along the stretch with tables and chairs spilling onto the walkway. It is also where you will find the best� hủ tiếu nam vang and� bánh canh cua in Singapore for only about SGD5 (VND86,000). Although their regular� phở� is not bad, they have a “spicy” version, which remains one of the best post-drinking supper recommendations I can give. I should also add that this restaurant doesn’t close until 4:00 am. 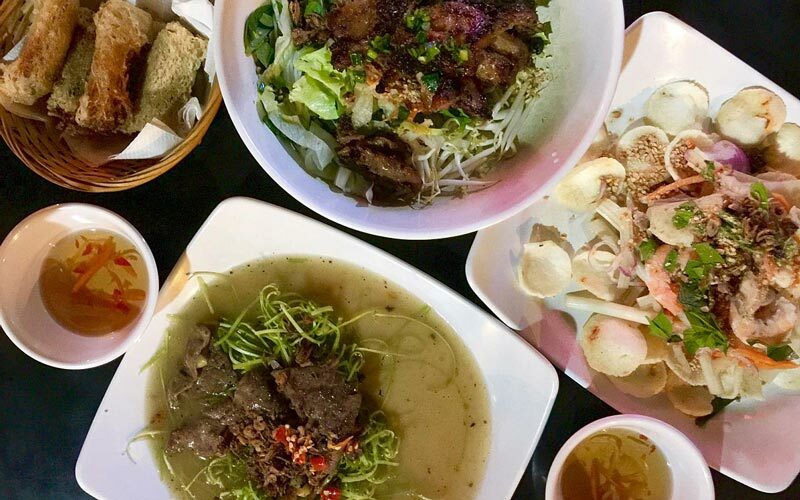 So, if you’re in Singapore and suddenly feeling a massive craving for Vietnamese food at 3 in the morning, you don’t want to empty your wallet, and you don’t mind some chaos along the way, then head to Thien Long Vietnamese Restaurant.